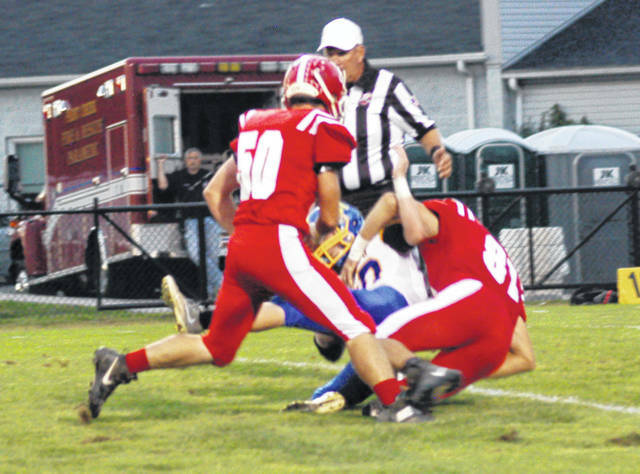 Hillsboro’s Luke Middleton (81) tackles a Rockets ball carrier as Richard Adkins (50) also gives chase on Friday at Richard’s Memorial Field in Hillsboro. The Hillsboro Indians moved up one spot in the weekly Associated Press poll after defeating the Clermont Northeastern Rockets on Friday, September 21, by a score of 29-7. The Indians moved into possession of 16th in the poll and earned 19 points overall. Hillsboro is the lone representative in the Frontier Athletic Conference as Jackson and Chillicothe fell out of the poll. Others receiving 12 or more points: Hilliard Davidson 38. Miamisburg 30. Cleveland St. Ignatius 22. Cincinnati Elder 17. Austintown-Fitch 16. Cincinnati Moeller 14. Clayton Northmont 13. Others receiving 12 or more points: Dresden Tri-Valley 30. Massillon Perry 21. Barberton 21. Amherst Steele 20. Cincinnati Winton Woods 14. Troy 14. Youngstown Boardman 13. Trenton Edgewood 12. Others receiving 12 or more points: Akron St. Vincent-St. Mary 31. Columbus Eastmoor Academy 30. Columbus Bishop Hartley 29. Millersburg West Holmes 29. Akron East 22. Hillsboro 19. Aurora 18. Alliance Marlington 16. Parma Padua 16. Granville 12. Others receiving 12 or more points: Waverly 44. Gnadenhutten Indian Valley 30. Others receiving 12 or more points: Akron Manchester 37. Wickliffe 30. Minford 29. West Lafayette Ridgewood 27. Portsmouth West 21. Anna 21. Cincinnati Purcell Marian 12. Others receiving 12 or more points: Beverly Fort Frye 29. St. Henry 27. Sugarcreek Garaway 23. Galion Northmor 16. Creston Norwayne 15. Cincinnati Deer Park 14. Others receiving 12 or more points: Glouster Trimble 38. Greenwich South Central 32. Convoy Crestview 30. Windham 28. Norwalk St. Paul 25. Arlington 21. Miami Valley Christian Academy 16. Youngstown Christian 14.
https://www.timesgazette.com/wp-content/uploads/sites/33/2018/09/web1_HIllsboro-Poll-Pic.jpgHillsboro’s Luke Middleton (81) tackles a Rockets ball carrier as Richard Adkins (50) also gives chase on Friday at Richard’s Memorial Field in Hillsboro.